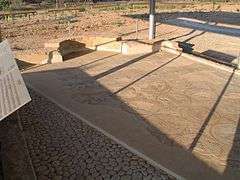 This article is about the architectural feature. For the astronomical term, see apsis. For the rock band, see Apse (band). For the acronym APS, see APS (disambiguation). Typical early Christian Byzantine apse with a hemispherical semi-dome in the Basilica of Sant'Apollinare in Classe. 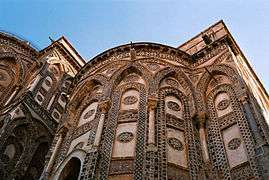 In architecture, an apse (from Latin absis: "arch, vault" from Greek ἀψίς apsis "arch"; sometimes written apsis; plural apsides) is a semicircular recess covered with a hemispherical vault or semi-dome, also known as an Exedra. In Byzantine, Romanesque, and Gothic Christian church (including cathedral and abbey) architecture, the term is applied to a semi-circular or polygonal termination of the main building at the liturgical east end (where the altar is), regardless of the shape of the roof, which may be flat, sloping, domed, or hemispherical. Smaller apses may also be in other locations, especially shrines. An apse is a semicircular recess covered with a hemispherical vault. 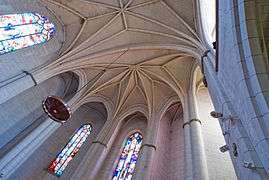 Commonly, the apse of a church, cathedral or basilica is the semicircular or polygonal termination to the choir or sanctuary, or sometimes at the end of an aisle. In relation to church architecture it is generally the name given to where the altar is placed or where the clergy are seated. An apse is occasionally found in a synagogue, e.g. Maoz Haim Synagogue. The apse is separated from the main part of the church by the transept. Smaller apses are sometimes built in locations other than the east end, especially for reliquaries or shrines of saints. The domed apse became a standard part of the church plan in the early Christian era. The chancel (or sanctuary), directly to the east beyond the choir contains the High Altar, where there is one (compare communion table). This area is reserved for the clergy, and was therefore formerly called the "presbytery," from the Greek presbuteros meaning "elder". Hemi-cyclic choirs, first developed in the East, came to use in France in 470. By the onset of the 13th century, they had been augmented with radiating apse chapels outside the choir aisle, the entire structure of Apse, Choir and radiating chapels coming to be known as the chevet (French, "headpiece"). 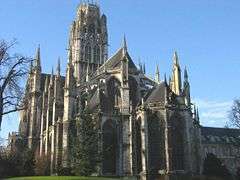 Famous northern French examples of chevets are in the Gothic cathedrals of Amiens, Beauvais and Reims. Such radiating chapels are found in England in Norwich and Canterbury cathedrals, but the fully developed feature is essentially French, though the Francophile connoisseur Henry III introduced it into Westminster Abbey. The word "ambulatory" refers to a curving aisle in the apse that passes behind the altar and choir, giving access to chapels in the chevet. An "ambulatory" ("walking space") may refer to the arcade passages that enclose a cloister in a monastery, or to other types of aisles round the edge of a church building, for example in circular churches. 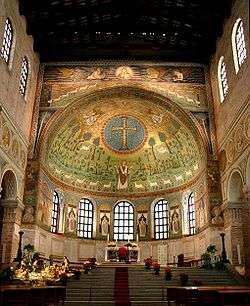 Triple apse of Basilica di Santa Giulia, northern Italy. East end of the abbey church of Saint-Ouen, showing the chevet, Rouen, Seine-Maritime. 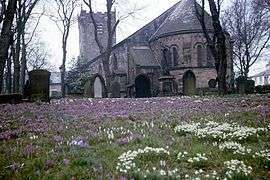 A simple apse set into the east end of St Chad's parish church, at Poulton-le-Fylde, Lancashire. The decorated apse of the Cathedral of Monreale, Sicily. 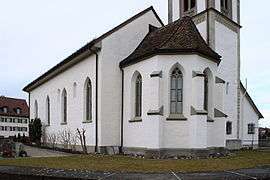 The apse of St. Martin church in Busskirch, community Jona, Switzerland. Apse for Torah Ark in the ancient Maon Synagogue. 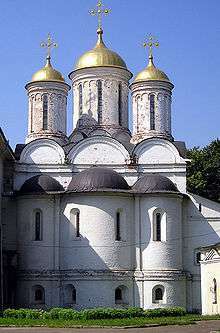 The triple apse of an Orthodox church in Yaroslavl, Russia. ↑ "Basilica of the National Shrine of the Immaculate Conception: Floor Plan". nationalshrine.com. Retrieved 27 August 2016. ↑ T. Poole (1907). "Apse". Catholic Encyclopedia. New Advent. Archived from the original on 4 June 2011. Retrieved 3 June 2011. ↑ Jane Vadnal (January 1998). "transept". Glossary of Medieval Art and Architecture. University of Pittsburgh. Retrieved 8 January 2013. ↑ "Apse". Wordnik - Wiktionary et al. Retrieved 27 August 2016. ↑ "Apse". Encyclopaedia Britannica. Retrieved 10 July 2012. Joseph Nechvatal, "Immersive Excess in the Apse of Lascaux", Technonoetic Arts 3, no. 3, 2005. Look up apse in Wiktionary, the free dictionary. Wikimedia Commons has media related to Apses.